The bee shed houses nucs and full colonies. The space available allows a maximum of two nucs and four full colonies arranged down one side of the shed. There’s additional space for 3-4 more nucs on the opposite side of the shed that is not currently used. In retrospect I should have purchased a shed twice as long (24′ not 12′) for flexibility, storage and to have more space to work in. Sometimes the full colonies need to be replaced by nucs so the entrances have to be compatible. In all cases the bees access the colony, or leave the shed depending upon the direction they’re travelling, from an unmodified hive through a hole in the wall. Therefore there needs to be a bee-tight interface between the wall of the shed and the front of the hive (or nuc). Without this there’s a chance the shed will fill with disorientated bees. What I’ve learned this season is that compatibility and flexibility are at least as important as security. It’s possible to build reasonably effective and secure interfaces without having everything tightly interlocking, screwed down or immovable. A combination of the weight of the hive, coupled with careful inspections, are sufficient to keep the colony in place. 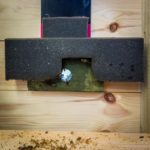 … the simplest way to provide access would be to push the face of the hive flush against the shed wall through which a hole had been cut at the right height from the ground. This would work perfectly, be bee tight, not require any hive modifications and be fully interchangeable. However, as the season progresses supers are added and these would also have to be placed flush with the shed wall. The first problem is that, without serious modification, the shed windows get in the way (see the image on the right). They almost always have an inner sill of some sort. The second problem is that having the hive tight against the wall reduces the space for frame or hive tool manipulation and makes returning supers more difficult. 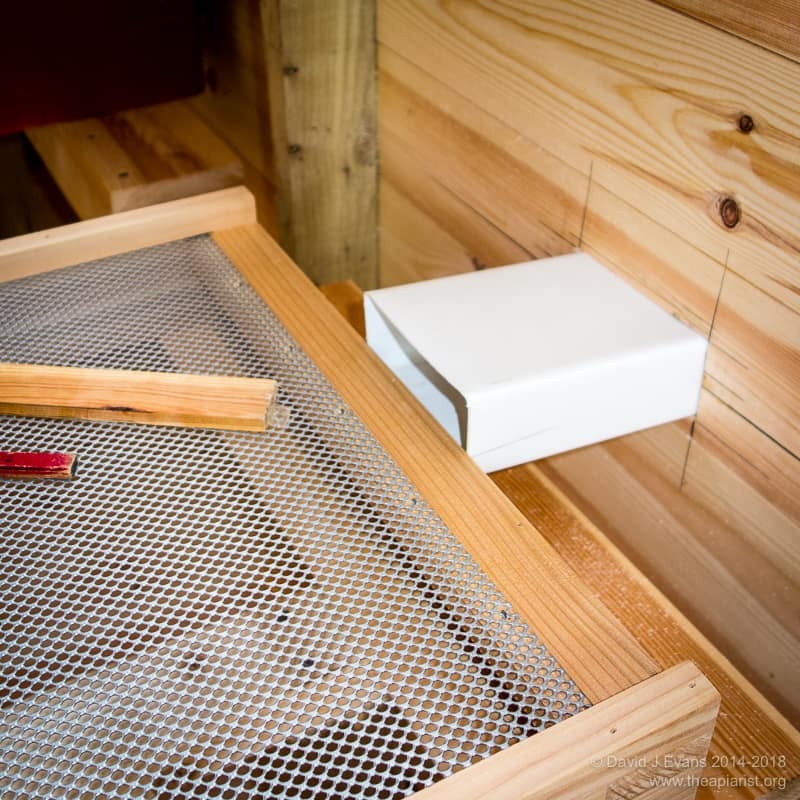 Finally, pushing the brood box and supers flush against the wall would prevent the use of a hive roof. Of course, since the colonies are in a shed the roof is not required for weatherproofing … but it’s essential to provide a safe place to stand the smoker as it cools down. All other surfaces are wood or Correx and I don’t want to burn the shed down. The required interchangeability with nucleus colonies raises two additional issues. Firstly the poly nucs I use (Everynucs) have an integral 2cm ‘landing board’ in front of the cavernous entrance slot. Pushing them ‘flush’ to the shed wall leaves a big gap. Secondly, the height of this entrance slot is not identical to the hive floors I use. I could build alternative floors or buy other nucs, but instead came up with a solution that saved me doing either (and since I have more invested in nuc boxes than the shed itself this made economic sense as well) and solved the problems with hive manipulations and adding supers. 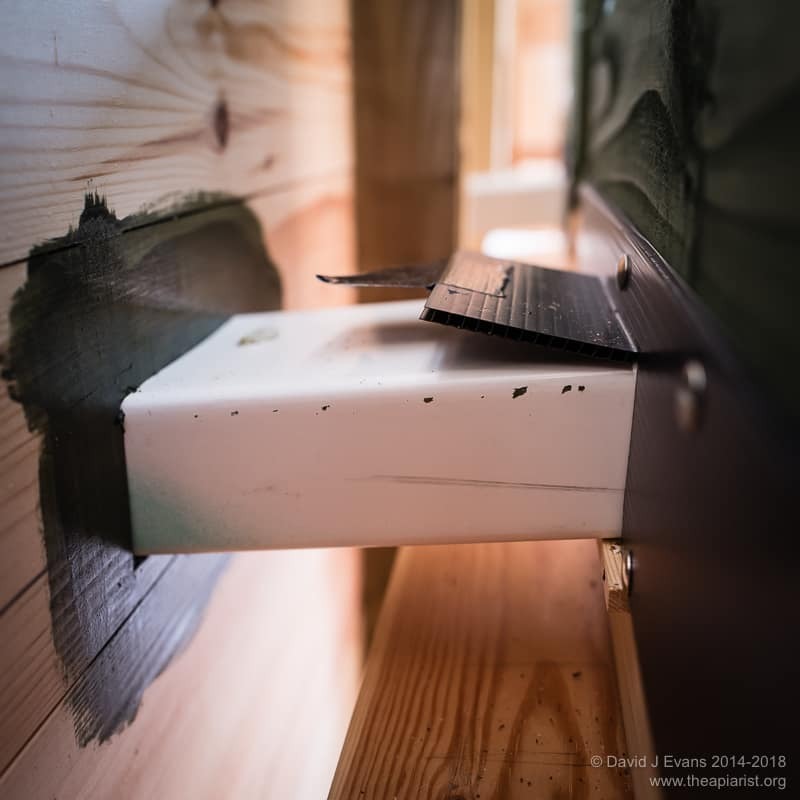 … required that the hives were separated from the shed wall by a short tunnel built from some spare rigid extractor fan ducting. 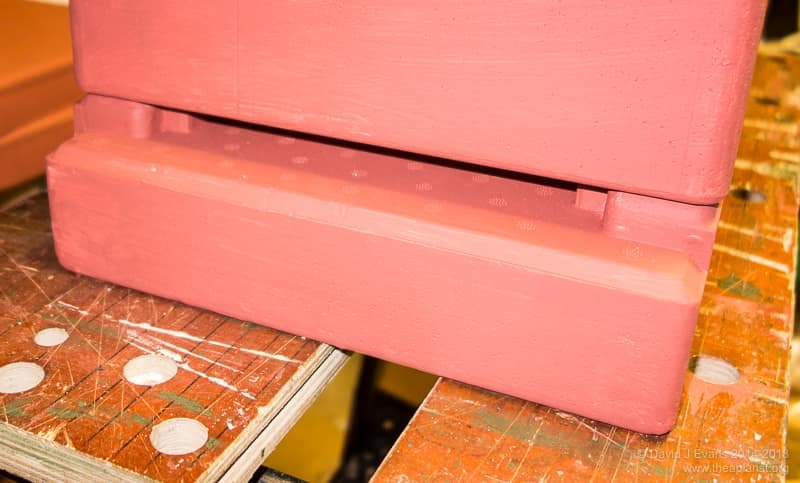 In the original design this was carefully shaped to fit neatly into the entrance slot of the hive, with the remaining front of the hive blanked off and blocked with an equally carefully shaped piece of Correx. This worked well … until the hive needed to be moved, or was inadvertently nudged during hive inspections. A partial solution was to screw the hive floor to the stand with L-shaped brackets. Although this prevented the accidental movement it made deliberate hive exchanges a right pain. It turns out that a far simpler solution is to have a simple flush-fitting piece of ducting (angled slightly upwards to prevent water ingress). One end is wedged into the hole in the shed wall, the other is butted up against the face of the hive. 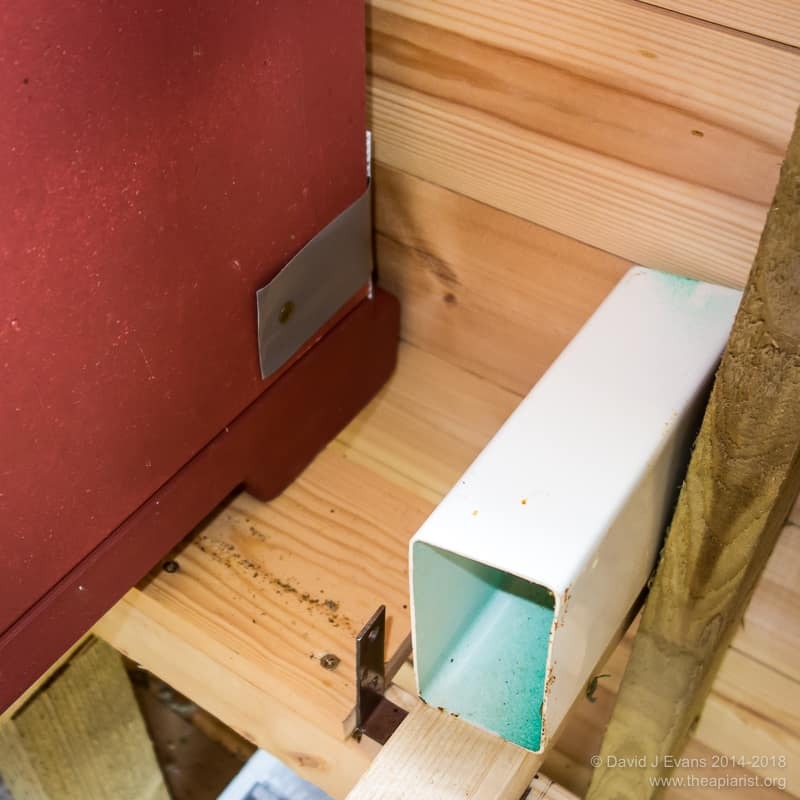 The remainder of the hive entrance slot is blocked with a standard entrance reducer screwed in place to the hive floor (not shown fixed in the picture on the right). This works a treat. The hive is heavy enough to not shift about unless deliberately moved. If I need to move it I can just pick it up as I would any other hive (i.e. carefully and with a lot of wincing). Because of the landing board these are actually easy to push flush to the shed wall, which still leaves just about enough space for frame manipulation and getting the roof on and off. 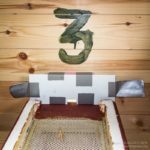 I originally discussed using a small block of foam with a small arch cut into it to allow the bees access to the wider world. It turned out that the bees quickly chewed through some of the original foam blocks I used and, if the block was too small, they were difficult to reposition when moving the nuc boxes. I’ve recently started using an improved entrance consisting of a denser piece of foam strapped to a suitably sized Correx offcut (see picture right). 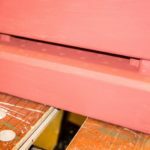 The simple gaffer tape ‘handles’ allow this to be pinned to the hive body for security and make it easy to relocate when moving the nucs. I’ve stopped strapping the nucs to the shed wall to prevent them moving … there’s no need if you’re careful when inspecting them. I do usually have a strap holding the lid on. Largely because if I don’t it’s something else to locate when I want to move the box. If I need to replace a full hive with a nuc I can simply remove the ducting and push the nuc flush with the shed wall. Finally, the two dedicated nuc entrances in the shed wall can be blanked off using a piece of Correx placed into a sort of ‘holder’ on the inner wall. This turns out to be unnecessary and I’ve barely used it. If I need to block the shed entrance I simply stuff it with foam. Unsubtle, but highly effective. 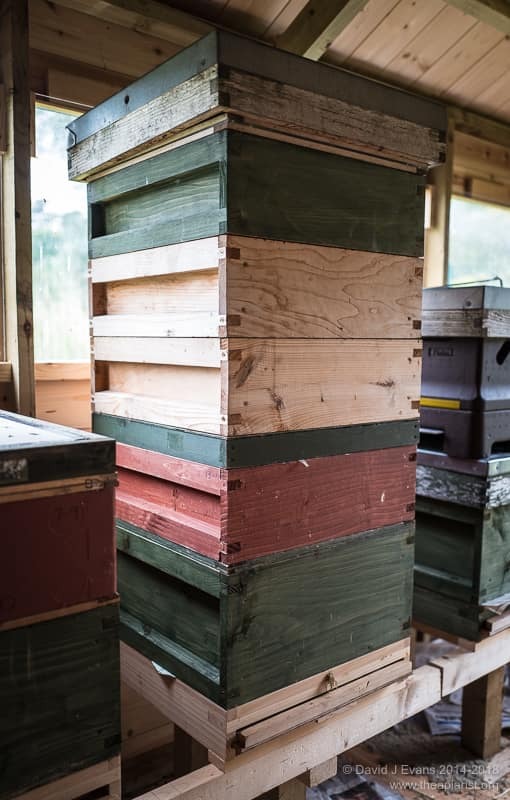 On the outside of the shed are a series of simple Correx landing boards in different colours to help the bees locate their own colonies. I’ve no evidence that this either reduces the level of drifting between colonies or increases the ease with which heavily-laden foragers return with pollen and nectar. However, even if the bees don’t find them useful, I like them. 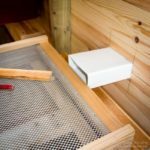 This entry was posted in Bee shed, Beekeeping, DIY on October 21, 2016 by David. I wonder if your design of “landing boards” might help to reduce the predations of the Asian Hornet, when it eventually spreads across much of the UK? They habitually hover in front of the hives and pounce at speed on returning laden foragers, but if the foragers enter the “tunnel” area quickly, the hornet will have less opportunity to pounce in the open area in front of the hive. If anything I’d suspect they might increase predation. The films I’ve seen have had the landing boards crowded with bees defending the hive, so returning foragers are forced to land short of the entrance. Perhaps better to have a recessed entrance and landing board. It’s noticeable that many bees using the full size entrances on hives in the bee shed fly directly into the tunnel, without using the landing board at all. Things have gone quiet after the first one or two reports of Asian hornets from the Gloucester area so perhaps things are under control. I guess we’ll find out next spring. Current predictions – based upon climate – suggest they should not be an issue in Scotland until global warming causes more climate change … by which time we’ll have bigger issues to worry about. Hello David, thank you for the response. I actually have hives in my garden in France, and have been observing and battling against the Asian Hornet for a couple of years. They don’ t seem to pick the bees off the landing boards, preferring to hover or zig-zag from side to side in front of and about 40cms from the entrance, intercepting the bees as they get their final bearings before landing. I thought maybe the tunnel entrance might encourage the bees to delay their final orientation manoeuvres until inside the tunnel, thus reducing the scope for the hornet to pounce from a distance. They have phenomenal acceleration from the hover, but have some difficulty in actually flying when carrying a bee, before they land on a nearby bush, and remove the head and abdomen of the bee, so lightening the load. Fortunately the hornet season in my area is coming to an end, I may try your entrance tunnel idea on one of my hives next year, but this will inhibit the pleasure of observing what pollen etc. the bees are bringing back. Remember that I have no experience with Asian hornets … and hope to remain that way. 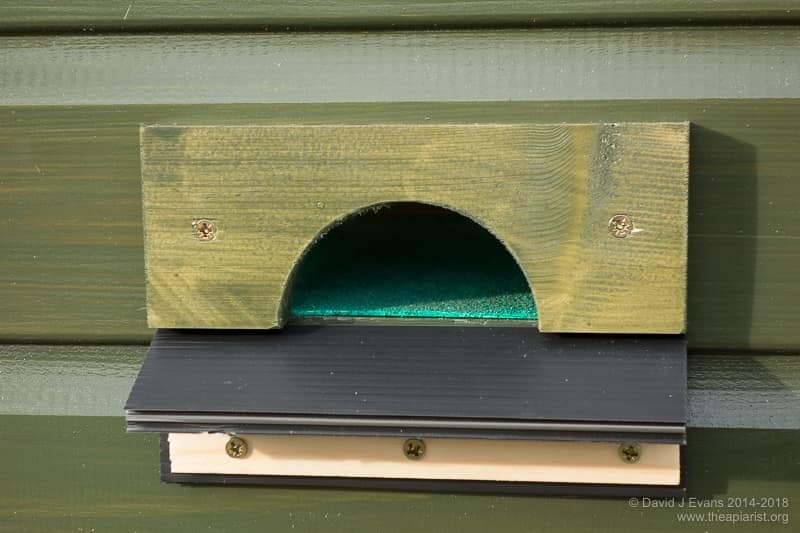 The bee shed entrances that lead a wide tunnel and have a semi-circular entrance about 8cm in diameter are the ones the bees can usually fly directly into, bypassing the landing board completely. I really hope they do not become established in the UK, it is quite heart-rending to watch them picking off the bees one by one. I suppose the only hope is that the wider they become established, the more the scientific community will endeavour to find an effective means of control. 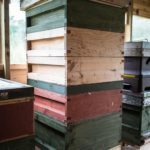 On the big bee house I learnt beekeeping in there was space for 40 hives (2*20), and an isle in the middle where we have space to work, with a stack of supers behind you – best lesson – have dollies so you can roll them about! There were no holes cut in the walls like your shed, the whole plank was removed and the hives sit 6-8 cm back from the wall. A landing board is continious on both sides of the shed. so there is no need for precision in the position of the hives laterally. The fronts are painted alternatively blue, yellow and white apparently to help the bees orientation. I belive the bees fly to about within 0,5m by navigation, and do the rest by smell myself. Will your elongated entrance be a hinderance for the bees cleaning out dead bees in the winter (could get blocked up with corpses)? That’s a far better size of shed! The ‘dollies’ would be great in the shed but I simply don’t have the space for them. I do use them when extracting as it makes it so much easier to move stacks of full supers about simply by rolling them. I had bees in the shed last winter and had no problems with accumulation of corpses. With a suitable LED torch it’s actually possible to peer through the entrance and just about see the floor of the hive. I’ve got a long piece of bent wire I can use to make space if needed. Yes a suitable LED…. Some are just fine, and some work like a red cloth to a bull (I suspect it has something to do with the level of “blue-uv” in the mix). Had one LED torch you could open the hive turn in on, and 50 bees would jump out at you. 5min later with a different lamp, they ignored me…. When we air the upstairs rooms in the morning or evening we must do it with the lights off since we switched to LED lightbulbs – attracts bees – had 3 in this morning at 7am! <12°C outside. It must be very specific wavelengths. I’ve got LED’s throughout much of the house and haven’t seen any bees attracted to it. The Ever Ready head torch I use for grafting (white) and popping QC’s into mini-nucs in the dark (red) doesn’t seem to irritate the bees at all. Finally, in the bee shed I use a ‘cheap as chips’ handheld LED torch which is also well tolerated.